The history of written language is fascinating. Humans have been trying to make a permanent record of their thoughts for at least 40,000 years, with our first attempts limited to simple paintings of hunting scenes, wild animals and handprints. Encoding our spoken language was not possible until about 5000 years ago when we began to use pictographs to represent whole words or phrases. These little drawings resembled exactly what they were depicting - so writing the word 'cat' would require drawing a simple picture of a cat. The ancient Sumerian, Egyptian, and Chinese civilizations used pictographs and eventually developed them into logographic writing, in which symbols that did not look like the word they represented could be used to depict words that were difficult to draw. This made written language more flexible since it became possible to write about abstract concepts that could not be drawn easily. Logographic writing systems have one important drawback: it takes a very long time to learn the system because so many characters need to be remembered. An example of a logographic system is written Chinese. A Chinese friend of mine estimates that the average Chinese university students needs to learn over 4000 characters! Written Chinese is a logographic language, meaning that whole words are represented by symbols that do not resemble their meaning. About 3000 years ago the Phoenicians, an ancient people who lived in the area that is now the coastline of modern Lebanon, invented a radically new way of writing which overcame some of the limitations of logographic systems. In this new system, written language was represented by symbols that corresponded to the speech sounds, or phonemes of the language, rather than to units of meaning. Interestingly, the English word segments phono- and phone- come from the Greek word for "sound" or "voice" - undoubtedly an homage to the Phoenicians. The Phoenician system had two important advantages over logographic systems: 1) spoken words could be written down regardless of their meanings and 2) only a relatively small number of symbols needed to be learnt for a speaker to be able to acquire the basic skills needed to read and spell the written version the language. So the Phoenician writing system was the first language to use an alphabet - a system of symbols that represent the phonemes (speech sounds) of language. The word "alphabet" is also from the Greek language and is a reference to the first two letters of the Greek alphabet: alpha and beta. This new way of writing was a huge success and spread quickly around the world. In fact, the Phoenician alphabet became the ancestor of almost all modern alphabetic languages, including English. Because it is an alphabetic language, English uses written symbols that are closely related to its phonological system. The word "phonological" means "the logic of the sounds". The phonological system of a language is the system of phonemes we use to encode and decode information when speaking and listening to each other talk. Humans are usually quite good at learning this phonological system for spoken communication without much explicit instruction. Most babies eventually develop the ability to understand and speak the language without taking lessons in English, however learning to understand how written English works requires explicit teaching. This is because learning to read and write is not natural - we haven't been reading and writing for long enough to have evolved specific brain structures solely responsible for reading and writing. In fact, our ability to read and write depends heavily on our ability to process spoken language. At its most fundamental level, reading is the process of deriving meaning from the words on a page. For most children, learning to read is a matter of mapping new, visual representations of our language onto existing spoken representations of the language. Most (but not all) six-year-old children who are learning to read, for example, are able to tell you what they did on the weekend, who their best friends are and maybe even how to craft a pickaxe in Minecraft. Despite this skill with oral language, they are still learning how to read and spell simple words such as "spot" at school. In other words, for most children, learning to read is a process of learning to recognise visual representations of words they already know. Research suggests the most effective method of teaching oneself to recognise new words is to be able to decode (e.g. Share & Shalev, 2004). Decoding is a term used to describe the process of reading an unfamiliar word by 'cracking the code' linking the letter patterns and speech sounds that make up the word. Try reading this word: "Sleeth". How did you read it? You couldn't have seen the word previously because I made it up. Skilled readers are good at mentally joining the speech sounds represented by letters and letter patterns to read unfamiliar words, including made-up ones like "sleeth" as well as difficult real words such as "rhinotillexomania". This code-cracking process of using letter-sound patterns to join phonemes together and read unfamiliar words has been shown through decades of research to be crucial in learning to read. Decoding skills allow children to access the thousands of words they have already heard but never seen in written form. They also help kids to learn completely new words by themselves. What an empowering tool! Unfortunately, learning to decode English is not straightforward. Despite being an alphabetic language, English does not have a consistent orthography, like Finnish or Italian, in which every phoneme has a corresponding grapheme. A grapheme is a letter or group of letters representing one phoneme. Some examples of graphemes include "t, p" and "igh". Some graphemes represent more than one phoneme in English (compare “school” with “chip”), and some phonemes are represented by more than one grapheme (consider “her, bird” and “turn”). Being able to teach children to read and spell English consequently requires the person doing the teaching to have (among other skills) an in-depth understanding of the relationship between English phonemes, graphemes and letters. A hamburger analogy can help students understand the relationship between phonemes (speech sounds), graphemes (letters and letter patterns representing speech sounds) and letters. Click on the image to see a more detailed infographic. Furthermore, decoding skills are not as useful when reading unfamiliar irregular words. Irregular words do not consist of regular grapheme-phoneme patterns. Examples include the words “bureau”, “yacht” and “colonel”. These words must be learned - at least to an extent - by 'sight', meaning that the irregular parts need to be remembered without relying on grapheme-phoneme relationships. Consequently, an understanding of which words are irregular and which ones are regular is another fundamental skill for anyone teaching kids to read and spell. Nevertheless, most English spelling is based on the phonological system of the language. In fact, approximately 50% of English words can be spelt correctly with grapheme-phoneme conversions alone, and a further 36% can be spelt with the exception of one grapheme-phoneme inconsistency (Hanna, 1966), making strong decoding ability a very powerful tool for self-teaching. Why do some students struggle with decoding? While most children acquire decoding ability without too much difficulty, a significant proportion of the population (around 10-20%) have great difficulty in developing adequate decoding skills. Research suggests that a large percentage of these students may have problems with developing decoding skills because they have trouble understanding and processing information to do with the phonemes in our language (Snowling & Hulme, 2011). 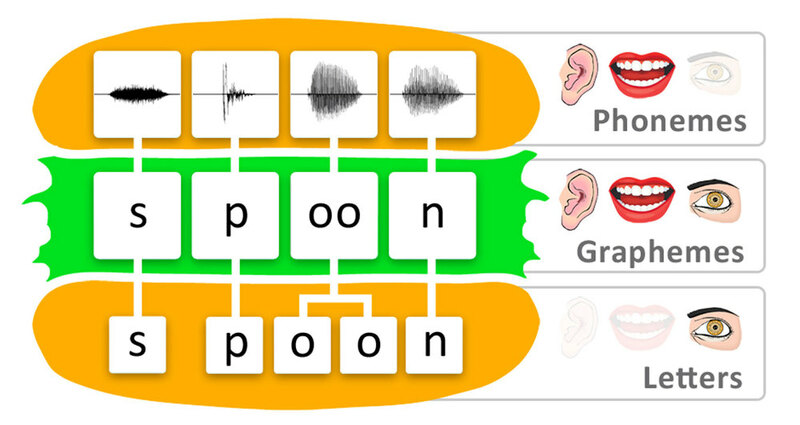 Having an understanding the sound structure of our language is called phonological awareness. Phonological awareness develops gradually, so very young children have a 'low resolution' understanding of the sound structure of language. For example, a child in kindergarten may be able to clap syllables and tell you whether 'fat' and 'cat' rhyme, but they may not be able to tell you the second speech sound in the word 'stop' and will probably look at you like you are an alien if you ask them what word is left if you take the /k/ sound out of /box/ (that's not a misprint!). In other words, phonological awareness begins with an awareness of the larger sound units in our language, such as whole words and syllables, but young children are not usually good at thinking about individual phonemes in words. Eventually, as children learn more words and their phonological awareness skills improve, most develop a 'high resolution' understanding of the sounds of language - they become aware of individual speech sounds in words. This subtype of phonological awareness is called phonemic awareness. Phonemic awareness has been shown through research to be a powerful predictor of future reading ability in beginning readers (e.g. Ehri et al., 2001). Furthermore, difficulty with phonemic awareness is a hallmark of dyslexia. Strong phonemic awareness skills give students learning to read an advantage in learning the relationships between phonemes and the letters and letter patterns that typically represent them. It helps students to learn to decode written language when reading unfamiliar words. It also helps students to successfully encode words when spelling. Students with poor phonemic awareness struggle with learning to decode, which significantly affects their ability to teach themselves new words when reading. They also find spelling more difficult since they can't use the clues offered by the sounds in words as easily. The importance of understanding and being able to process the speech sounds in language when reading and spelling is not surprising when you consider that our written language is alphabetic! Of course, there's more to reading than decoding. Some children also have difficulties with understanding what they read because they do not have the underlying language skills to comprehend the words they are reading (Hulme & Snowling, 2011). The importance of developing strong listening comprehension skills cannot be underemphasised. Indeed, research suggests that good decoders with poor reading comprehension also have poor listening comprehension skills and are therefore likely to have underling language difficulties. Research also suggests that a large proportion of children with reading comprehension difficulties are poor comprehenders due to decoding difficulties (see Vellutino, Fletcher, Snowling, & Scanlon, 2004 for a review). Consequently, any evaluation of reading ability needs to take into account language comprehension skills as well as phonemic awareness, grapheme knowledge and decoding skills. An overwhelming body of research suggests that we should teach kids to read through phonics. Teaching phonics involves explicitly and systematically teaching children to understand how all the phonemes of our language are represented by letters - in other words, teaching phonics is synonymous with teaching students how to decode and encode written language. Teaching phonics effectively teaches kids to teach themselves. It helps students to become fluent readers who understand what they read and have excellent strategies for decoding unfamiliar words. It also helps students become proficient spellers who have excellent strategies for encoding words when writing. Three national inquiries into the teaching of reading (conducted in the US, UK and Australia) have recommended that all students who are learning to read be taught using a synthetic phonics approach, which has strong scientific support and leads to greater gains compared with other approaches. However, despite the overwhelming evidence in support of teaching synthetic phonics, a minority of Australian schools use a synthetic phonics approach in teaching their students to read (Buckingham, Wheldall, & Beaman-Wheldall, 2013). I think the Phoenicians would have been very surprised! Dr. Bartek Rajkowski, PhD, is a Speech & Language Pathologist with extensive experience in helping people with reading and spelling difficulties. He is also the director of Adelaide Speech Pathology Services and the creator of Reading Doctor Software. Ehri, L. C., Nunes, S. R., Willows, D. M., Schuster, B. V., Yaghoub-Zadeh, Z., & Shanahan, T. (2001). Phonemic Awareness Instruction Helps Children Learn to Read: Evidence From the National Reading Panel’s Meta-Analysis. Reading Research Quarterly, 36(3), 250–287. Hulme, C., & Snowling, M. J. (2011). Children’s reading comprehension difficulties: nature, causes, and treatments. Current Directions in Psychological Science, 20(3), 139–142. Share, D. L., & Shalev, C. (2004). Self-Teaching in Normal and Disabled Readers. Reading and Writing: An Interdisciplinary Journal, 17(7), 769–800. Snowling, M. J., & Hulme, C. (2011). Evidence-based interventions for reading and language difficulties: Creating a virtuous circle. British Journal of Educational Psychology, 81(1), 1–23.